ULTRAkILLER, Other Virtual Synth from NOVAkILL. 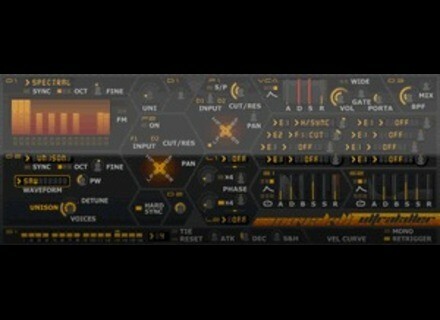 NOVAkILL has announced the release of two new virtual analogue synth VST instrument plug-ins for Windows: ULTRAkILLER, which is only available with NOVAkILL's new album, "I HATE GOD"), and NEOkILLER III, which is free. 1. BASIC oscillator is just that with 7 waveform choices. 2. UNISON oscillator has 11 waveforms and built-in Unison [low CPU use]. Unison mode with up to 7 voices. Two State-Variable Filters with complex stereo routing options and mixable Low-Pass, High-Pass, Band Pass and Band Reject filter modes. 2 x 6-stage Modulation Envelopes with looping and assignable interpolation modes. 2 x Randomators [accessed from Mod Matrix]. Dedicated ADSR envelope for VCA stage. 2 separate overdrive stages, one per oscillator and one post-VCA. 2 Quad Oscillators from la-la.com. State-Variable Filters with mixable Low-Pass [12 or 24dB/octave], High-Pass, Band Pass and Band Reject filter modes. 6-stage Modulation Envelopes with looping and assignable interpolation modes. 2 separate overdrive stages, one per voice [pre-filter] and one post-VCA. FatLoud Pro Series: Urban Orchestra Urban Orchestra is a collection of 100 urban orchestral loops, plus 30 one-shot chords / hits, with about 800MB of multiformat material for hip-hop, R&B, and modern pop producers. NoiseSoft Break Filter Noise Soft has announced the release of Break Filter, a new VST filter and distortion effect plug-in for Windows. Prime Loops Presents: Fidget House Grooves Fidget House is a new style of House music, and blends a diverse range of genres together such as Electro, Chicago House, Bassline, Breaks, elements of Drum n Bass, Rave, Funky and more.